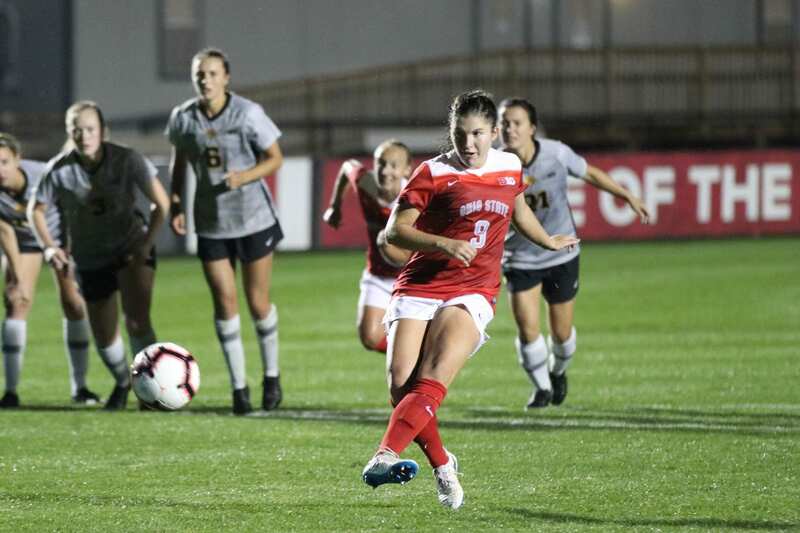 With the end of the 2018 regular season slowly coming to an end, the Ohio State women’s soccer team (7-5-3, 4-2-3 Big Ten) will matchup against Purdue on Thursday at 6 p.m. and No. 19 Wisconsin on Sunday at 2 p.m.
Purdue junior midfielder Ena Sabanagic and sophomore midfielder/forward Kylie Hase continue to be dynamic playmakers for the Boilermakers (6-6-4, 1-5-3 Big Ten) offense so far this season, with Sabanagic notching three goals against Illinois, Louisville and Michigan State, in addition to Hase scoring seven goals on the season. After Ohio State contends with Purdue on Thursday, it will then return back home to play at Jesse Owens Memorial Stadium for its final game of the regular season versus Wisconsin on Sunday. The Badgers (11-2-3, 5-1-3 Big Ten) will hope to continue its ongoing success this season when facing the Buckeyes. Its offense remains a reliable strength, recently scoring three goals against Minnesota and gaining its 11th win of the year. Sophomore forward Lauren Rice and junior goalkeeper Jordyn Bloomer are key players on the Badgers offense, with Rice totaling six goals and Bloomer tallying 47 saves with a 0.770 save percentage on the year. After a pair of ties against Rutgers and Maryland, the Buckeyes will hope to capture a pair of wins before heading to the Big Ten tournament. Senior forward Eleanor Gabriel said defending remains a strength with any team in this league and that both teams this upcoming weekend were always the top teams in the past. She said the team needs to keep its minds sharp for this week of training and not take any games lightly in order to finish out the regular season strong. Among a rollercoaster of a season up to this point, the Buckeyes still struggle to find a way to maintain its consistency game-by-game. The biggest challenge currently facing Ohio State is its offensive unit this year. However, sophomore defender Izzy Rodriguez said the team has been playing good soccer overall. Trying to secure a victory following this weekend’s duo of matches, Gabriel said this will be the ultimate test for the Buckeyes to see if the team will have what it takes to find more success down the stretch before entering the postseason.